Probably the best-known radio personality in America for decades, as well as being known as the voice of Shaggy in the Scooby-Doo cartoons, Casey Kasem passed away on Sunday at the age of 82. Much has been made and will be made about the turmoil within his family over his care the last few years, but Toobworld Central would like to focus instead on his career in Earth Prime-Time today. 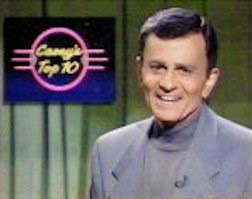 And that's why Casey Kasem has been fast-tracked into the Television Crossover Hall Of Fame in the League of Themselves wing. 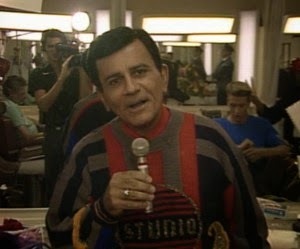 Because he was the go-to voice across America for the weekly countdown of the Top 40 music hits of the day, Kasem was also in demand for his presence on TV shows because of that distinctive voice. He served as the Master Of Ceremonies in some of these appearances, or stepped in to do a live presentation of his radio format tailored to a particular audience. 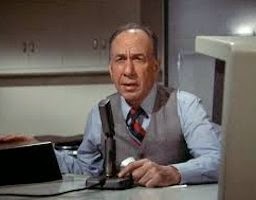 And it's because of his special guest appearances as himself in these shows that we can forge the link between usually un-connected shows like 'Alf' and 'Matt Houston'. Here's a run-down of the shows which qualified Casey Kasem for membership in the Hall of Fame. Kasem was credited as "Master of Ceremonies", but as that hosting gig usually involves a celebrity I think it's safe to assume that he was playing himself. 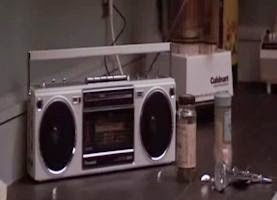 "I'm Dreaming of a Holiday Episode"
Casey Kasem may have appeared in a dream sequence about Joey and Michael still living together and getting older and older. But if so, that doesn't negate Kasem's presence in Toobworld for this. 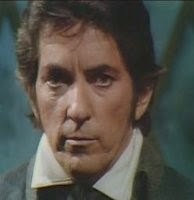 It just means that he was well enough known in the "reality" of Earth Prime-Time to supply the fodder for the dreamscape. Kasem definitely was in a dream sequence for this show, as Alf dreamt what Life would have been like had he been a famous comedian. 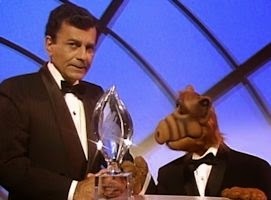 At one point he shared the stage with Casey Kasem at the People's Choice Awards. 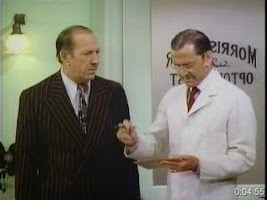 As the main character in this sitcom could make the denizens of his imagination become reality, it's pozz'ble, just pozz'ble that Casey Kasem was a living figment from Walter Kellogg's mind. 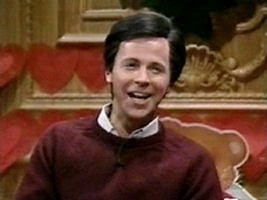 Although it often felt as though it was firmly entrenched in Skitlandia, 'The Martin Show' is part of Earth Prime-Time. There just happened to have been a TV show being produced within that TV show. And the only reason I mention this appearance from the Cineverse is because the Ghostbusters have a presence in the Tooniverse. And who knows? 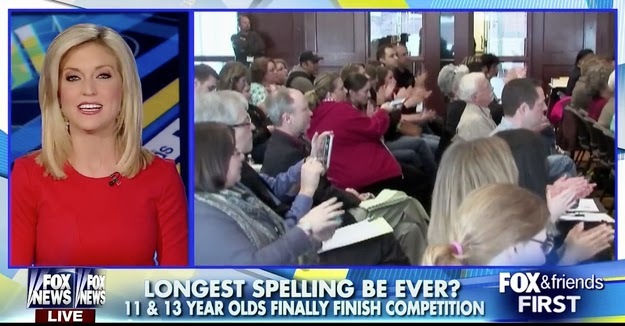 Maybe one day they'll be found in Earth Prime-Time. "Still making headlines all across the country, the Ghostbusters are at it again. This time at the fashionable dance club, The Rose. The boys in gray slugged it out with a pretty pesky poltergeist, then stayed on to dance the night away with some of the lovely ladies who witnessed the disturbance. 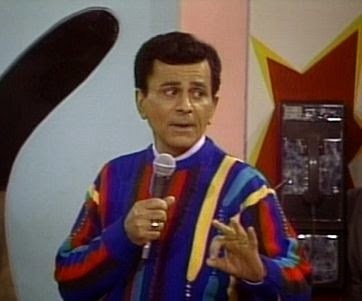 This is Casey Kasem. Now on with the countdown." Despite how popular they could be, most other radio personalities remain rooted in that particular universe borne of Mankind's aural imagination. But Casey Kasem was a true multiversal - the Radio Universe, the Cineverse, the Tooniverse, Skitlandia, and Earth Prime-Time. 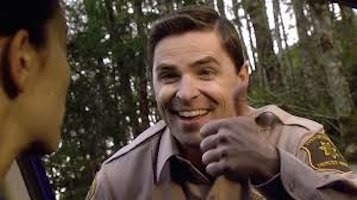 He deserves to be in the Television Crossover Hall Of Fame. "Keep your feet on the ground and keep reaching for the stars!" 'Sliders' is one of the essential series of the Toobworld Dynamic. Its premise stated that there were thousands of alternate dimensions and not just the Evil Mirror Universe (Evil Toobworld) we had come to know thanks to 'Star Trek'. Thanks to 'Sliders', we had plenty of worlds in which we could put those shows that just didn't fit on Earth Prime-Time. 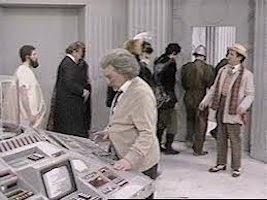 During the run of 'Sliders', they visited at least one new dimension each week; sometimes an episode began with them just wrapping up their adventure on some world on which we got only a minimal sampling of the differences from their Earth Prime-Time (or our Earth Prime.) One alternate Toobworld was highly litigious; everybody was obsessed with filing lawsuits against each other. On another Earth, there as an Azure Bridge in San Francisco, not a Golden Gate Bridge. There was a world on which women were the dominant gender and another where women freely grew facial hair. On that world, it was manifested mostly as tufts of chin-fur. But that might have only been the fashion style of that year. 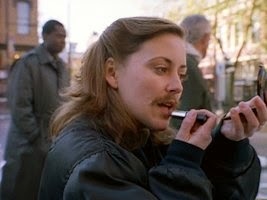 From this picture it looks as though women grew mustaches as well. If so, that means it would have affected all the women in that society, even those who had counterparts in Earth Prime-Time. And that would have included Mrs. Emma Peel, talented amateur, as seen in 'The Avengers'. 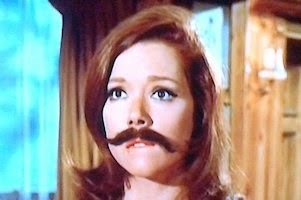 This is not to say that 'The Avengers' is to be found only in another dimension; just that there would be a dimension in which Mrs. Peel had a mustache. And there would be still another, that previously mentioned Toobworld where women ruled, on which Mrs. Peel would be the top professional and John Steed would be the talented amateur. "Neil, be as humble as you like. Einstein was the most modest man I ever met." "Sure, he could afford to be. He was a genius." In the Trueniverse, German-born Albert Einstein was the world's most famous theoretical physicist who developed the foundation for modern physics with his general theory of relativity. He was a Nobel prize winner for his work in establishing quantum theory and is perhaps best known for his mass-energy equivalence formula of "E = mc2". In Toobworld? Einstein convinced President Harry Truman that a secret scientific community should be established where the country's geniuses could work on their experiments, free from international threat and with access to the funds necessary to complete the research. 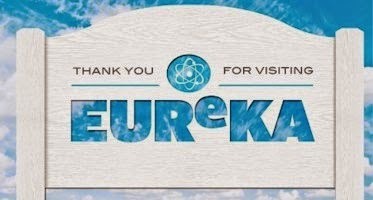 Such a town was established in Oregon and named Eureka, centered around the company of Global Dynamics. 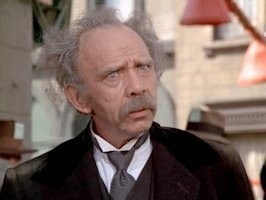 It was in Eureka that Dr. Cahill first met Einstein, as one of the original citizens of the town. 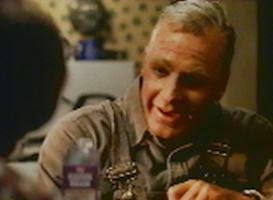 His specialty was in cybernetics and he was instrumental in the development of the positronic brain necessary for robots and androids - one of which would eventually become a law enforcement officer in Eureka known as Deputy Andy. Over the next decade, Marshall Cahill and his wife Amelia (a research scientist delving into the disciplines of utopian social dynamics) grew distant from each other, although Cahill still loved her fiercely. Mrs. Cahill finally left Eureka in the mid-1960s to work for a rival scientific community that called itself "The Dharma Initiative". The report of her death drove Cahill to be more protective of his son. Neil didn't share the IQ capacity of his parents but he at least struggled to measure up to his father's reputation in memory of his mother. Eventually Cahill left Eureka for Los Angeles, to accept the directorship of a government-funded think tank known as the Cybernetic Research Institute. There he was able to continue his work on the development of robots and androids while master-minding war games for the Defense Department to prepare for a fully computerized future war. In order to prove himself, Neil Cahill worked for a time as the research assistant to Dr. Carl Finch in London. But when Finch died before revealing the nature of his research to the world (save for the notes he sent to an old colleague, Professor Howard Nicholson), Neil stole the research and then reworked it to claim that he had come up with this scientific breakthrough. 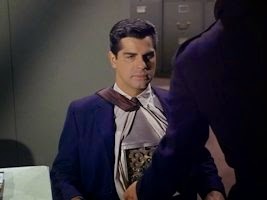 But Professor Nicholson, who also worked at the Cybernetic Research Institute, went to Dr. Cahill and threatened to go to the authorities with what he knew unless Neil confessed to being a fraud. As Neil was Cahill's last link to the memory of his wife (Neil probably resembled her - he certainly didn't look like his father! ), the scientist murdered the elderly research chemist and made it look like a break-in by some gang in order to steal drugs. 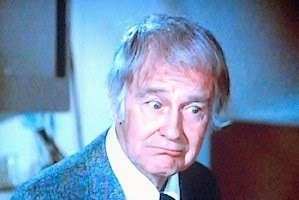 Unfortunately for Dr. Cahill, a Los Angeles homicide detective named Lt. Columbo was able to see through that ploy. As he told Cahill later: "That first day I couldn't give a hoot in hell about a thief. I was looking for a cigar smoker and there you were." Marshall Cahill was convicted and sentenced to twenty years with a chance for parole in five. However, there were forces in the world who recognized that Cahill's mind was too brilliant to be kept shut away in prison for such a long time. It may have been the work of a revived "Village" or some other rogue organization, but Cahill's death was faked in prison and the body stolen during transport to the morgue. He was later revived to continue his research, perhaps under duress, and perhaps by his own government, until the day he actually did die in the early 1990s. As for Neil, he eventually rebuilt his reputation with the help of Dr. Margaret Nicholson, his therapist and the widow of Professor Nicholson. He entered the teaching profession and landed the position of principal at a Los Angeles high school. There he avoided any further encounters with the police until one of his students killed another. Although it was considered something of a scandal for a short time [considering she had been his therapist and his father had murdered her husband], Neil and Margaret eventually married. 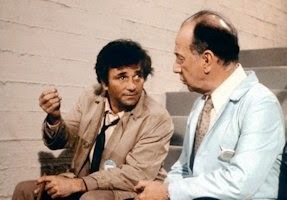 Since Einstein didn't appear in the 'Columbo' episode, we can choose any other incarnation of the scientific genius from another TV series. 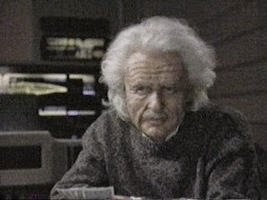 I think Ed Metzger's multiple appearances on TV as Einstein, especially in an episode of 'Touched By An Angel' (which also featured Harold Gould as an even older Einstein), should be the official portrait of the Professor. As for being seen on TV in 'Star Trek: The Next Generation' and 'Mentors', those were computer-simulated holograms and subject to interpretation by the programmers of the data input. 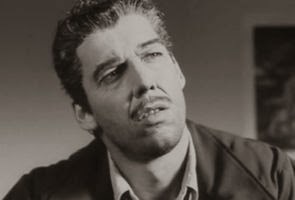 To prevent any recastaway Zonks, many of the appearances of Einstein's televersions in TV movies and mini-series should be relegated to alternate TV dimensions. It also helps to spread the love. 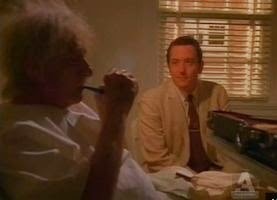 The Fourth Incarnation of the Time Lord known as the Doctor claimed to have known Einstein. Since he was only mentioned and not seen, we can accept him as being the Einstein of Earth Prime-Time. 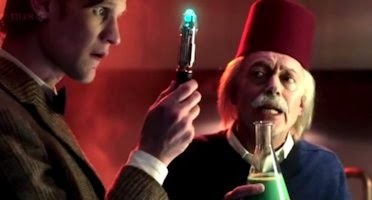 The Einstein who met the Eleventh Doctor, however, was from another dimension, during one of those trips made by a vessel that could travel through Time And The Relative Dimensions In Space. As for his encounter with the Seventh Doctor, I think we can give that a pass and accept him as the Einstein of the main Toobworld. Any physical discrepancies can be chalked up to fluctuations from travel inside the TARDIS and/or the Doctor's faulty memory on the trip. 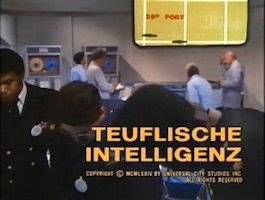 The screencap of the episode's title in German plays no part in the activities which played out within the story, except to indicate that particular version took place in the alternate TV dimension of German Toobworld. I was tempted to use a picture of Robert Walker, Jr.'s mother - actress Jennifer Jones - to represent Mrs. Cahill. But I decided it was better to forge yet another missing link to a TV show by using Julie Adams from 'Lost' as Amelia. 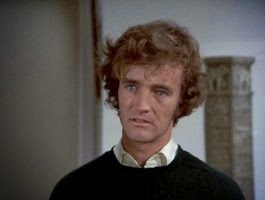 Dr. Cahill's prison sentence was suggesed by Nathan Sikes for "The Ultimate Lieutenant Columbo Site". This has been a combination of two biographical profiles from "The Tele-Folks Directory" - one for Einstein and the other for the Cahills. "All you have at the moment is a theory. Will tell you that a theory isn't worth a damn unless it can be proved." This is dedicated to my friend, Mark Thompson, who turned away from the study of theoretical physics for something more lucrative... and FUN! The latest venture by a Toobworld native into the Cineverse has just as interesting a story behind the scenes as it does on the screen. Rob Thomas used "crowdsourcing" to fund the movie version of his show 'Veronica Mars' and made his intended goal within 12 hours. The film will star most of the original actors as their characters from the series, picking up the lives of the Neptune, California, citizens ten years after the series ended. This is definitely a movie which will be absorbed into the TV Universe! 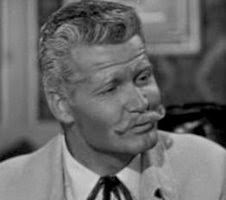 Lieutenant Columbo couldn't figure out how to break Van Wyck's alibi for the shooting of his mother-in-law until by chance he saw the replay of a controversial play during a football game while grabbing his dinner at a pub. See you in anothuh life, Bruthah! 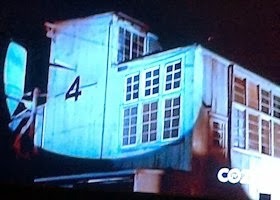 Well, OF COURSE Marshall Sam McCloud would have to rescue his girl-friend in a warehouse designated with one of the numbers from the Valenzetti Sequence! 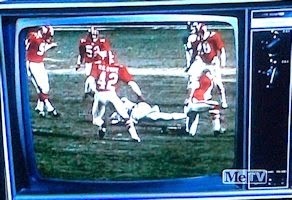 'McCloud' - "Give My Regrets To Broadway"
See You In Another Life, Brutha! NUMBERS RUNNING - PSYCHING OUT ON "42"
In the eighth season premiere of 'Psych', a security organization for the Royals was identified as "42". This is the final number in the Valenzetti Sequence of numbers made famous in 'Lost'. 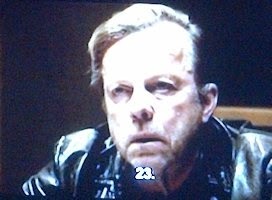 I'm celebrating my brother Andrew's birthday with a lot of posts about "the Numbers" from 'Lost'. Why? Shut up. 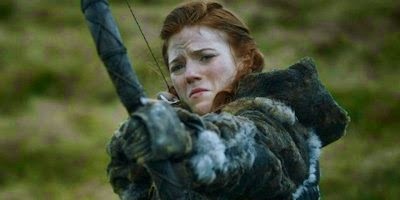 BORN TO RERUN - YGRITTE, "THE REAL WILD CHILD"
As mentioned in the previous post, tonight we'll be seeing the final episode of Season Four in the 'Game Of Thrones' saga. Within the Toobworld Dynamic (I do NOT speak for George R.R. Martin or the show's production team! ), the series takes place in the distant past on Earth's older twin, the planet Mondas, which once had an synchronous orbit with the third rock from the sun. To mark the occasion, here's a new interpretation of the show's theme song, this time done up right and proper Nawleens style by the Swamp Donkeys! This was recorded last Monday night, after the band saw the events of Episode Nine ("The Watchers On The Wall") play out. It's become tradition that the big set piece of each season occurs in the ninth episode and this was certainly no exception! With these duos, the science of tele-genetics gets a big boost because they prove that DNA can be matched exactly in succeeding generations. Sgt. 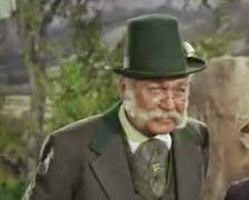 Morgan O'Rourke & Morgan O'Rourke, Sr.
"Did Your Father Come From Ireland?" 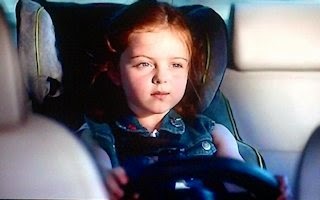 "How Will They Remember Me?" 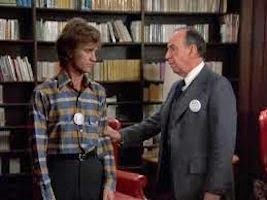 "The Leap Home Part 1 - November 25, 1969"
"Promised Land - December 22, 1971"
With our fifth entry, we had to arrive at the choice from the opposite direction: Who could have played the father first and then the son on their respective series? 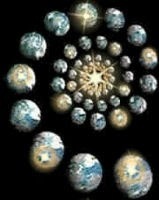 And what better place to search than in the dimension of Parralel Time?